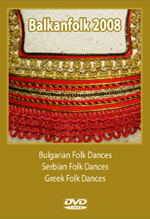 The DVD entitled “Balkanfolk 2008 – Bulgarian, Serbian and Greek Folk Dances” includes 15 Bulgarian traditional folk dances, 20 Serbian traditional folk dances and 17 Greek traditional folk dances from all ethnographical regions of the respective country. The dances are taught by the teachers Emil Genov from Sofia - Bulgaria, Vladimir Mutavdžić from Nish - Serbia and Aikaterini Louloudi (Kakia) from Thessaloniki - Greece and are performed by the participants in Balkanfolk 2008. The DVD is suitable for dancers who have mastered intermediate and higher level of Bulgarian, Serbian and Greek folklore dances.